Two friends from work (JS) and (MK) alerted me it is National Donut Day. Or is it Doughnut? It is the 75th one so where have I been all these years? I usually get that kind of info from Foodimentary blog and he is saying it is National Doughnut WEEKEND! 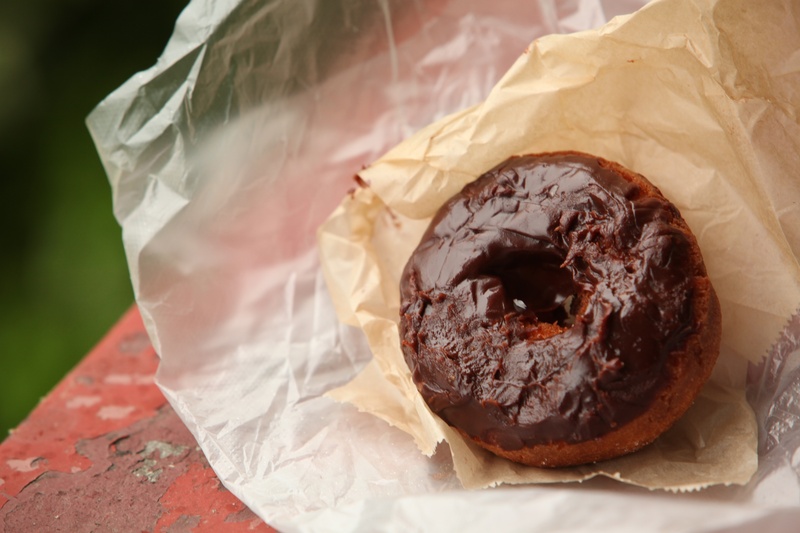 and then my friend Steve came home with a chocolate donut he had gotten for FREE at the Giant Eagle. Can you believe it ? And he offered it to me. So of course I took that donut and unwrapped the wrinkled bakery tissue from the sticky frosting (humidity is high high high today) and put it out on the front porch ledge and started to shoot away. I did take a bite out of it for photographic purposes. Honestly, they don’t make donuts like they used to back when I was a kid………… The peeling paint on the stone ledge adds a lot to the photo in my opinion. Free from Giant Eagle today on National Donut Day.